England all-rounder Ben Stokes has signed a three-year contract extension at Durham to keep him with the county until 2021. The 27-year-old began his career with the county and made his one-day debut for Durham during the 2009 season. He made his senior debut for England two years later and has gone on to play 52 Tests for his country. 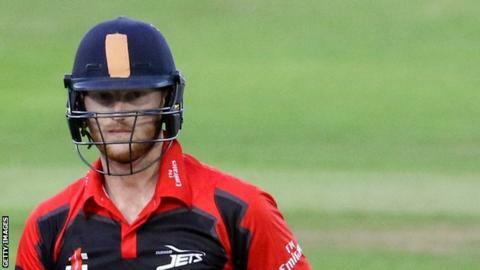 "I love playing for Durham and am delighted to be signing a new long-term deal where I learnt my trade," he said. "I'm very passionate about helping Durham compete at the top level and, if I am given any opportunities to play this season, I will give everything to the club. "It's an exciting time at Durham, especially with the rebrand of the club this winter and having a new coach, chief executive and sporting director in charge." Stokes made his England Test debut during their Ashes tour of 2013-14, and later made his maiden hundred in the third Test at Perth. The left-hander, who is set to join up with the Rajasthan Royals in this year's Indian Premier League, has averaged 33.89 and has taken 127 wickets in Test cricket. "Ben is a shining example of what our young players can achieve with hard work and dedication to go alongside talent," Durham chief executive Tim Bostock said. "He is now in the prime of his career and, while we may not see him as much as we would like over the next year, his influence remains huge around the club."